On July 1, 1863, Elizabeth ventured to East Cemetery Hill, shown on the other side of the Baltimore Pike in this photograph, and assisted Union officers in pointing out the roads and other landmarks. She was shielded by a horse that she stayed on the east and southeast sides of. Culp’s Hill is in the right background. This view was taken from the northwest facing southeast at approximately 4:30 PM on Friday, May 9, 2008. 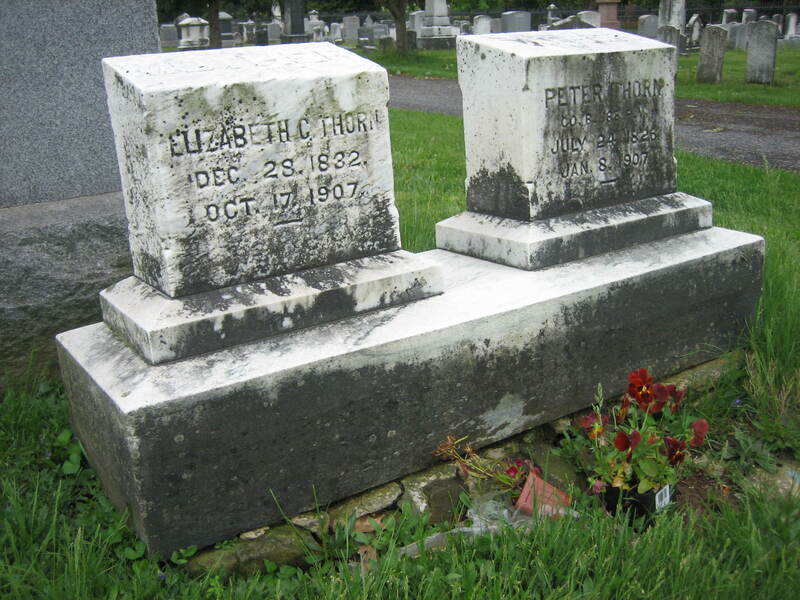 Elizabeth Thorn was the wife of the caretaker of Evergreen Cemetery when the Civil War began. 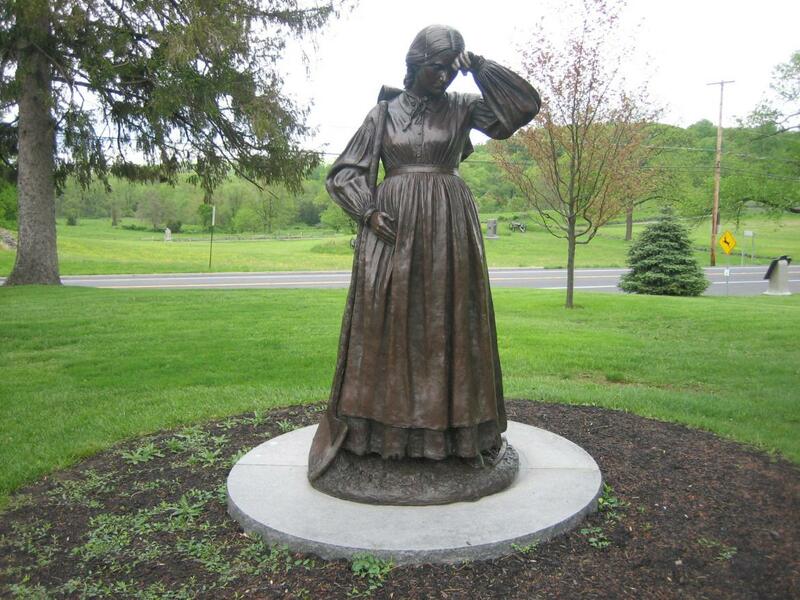 After her husband, Peter, joined the United States army in August, 1862. For the next three years, Elizabeth was the caretaker of the cemetery. In the three weeks following the battle she dug 105 graves. Her father, John Masser (1797-) helped her somewhat, and other men she hired helped a little, but her father was old, those men became ill, and they left the work mostly up to her. 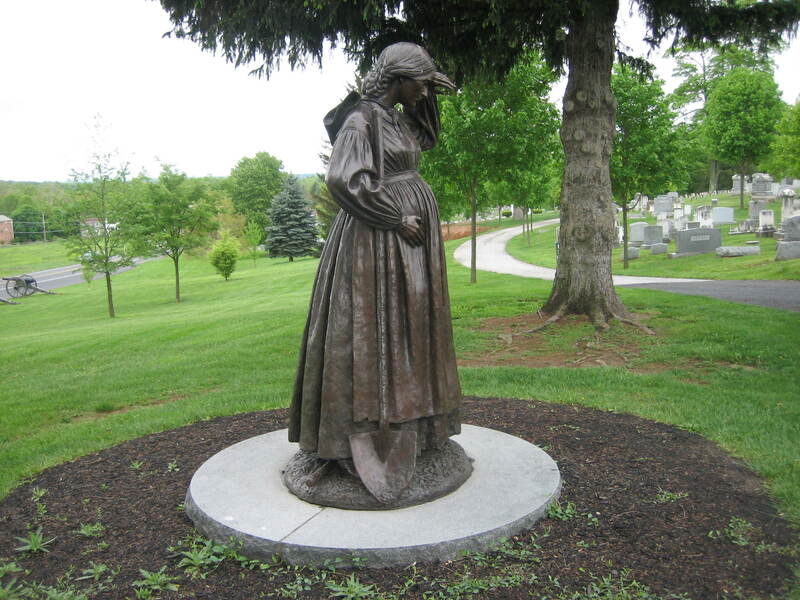 She did not receive more compensation than the $13 a month she regularly received as caretaker of the cemetery, and she was six months pregnant. Elizabeth Thorn (1832-1907) was six months pregnant at the time of the battle. Her daughter, Rose Meade Thorn (named in part after the United States commander at Gettysburg) was born in September, 1863. This view was taken from the north facing south at approximately 4:30 PM on Friday, May 9, 2008. Elizabeth and Peter lived in the cemetery gatehouse for 19 years. Elizabeth and her family left the house the morning of July 2, 1863 and returned on July 7, 1863. As Elizabeth later described the scene, “everything in the house was gone except three feather beds and a couple of pillows. The beds and a dozen pillows we had brought from the old country (Germany) were not fit to use again. The legs of six soldiers had been amputated on the beds in ourhouse and they wre ruined with blood and we had to make way with them.” This view was taken from the south facing north at approximately 4:30 PM on Friday, May 9, 2008. The statue was sculpted by Ron Tunison, and dedicated on November 16, 2002. 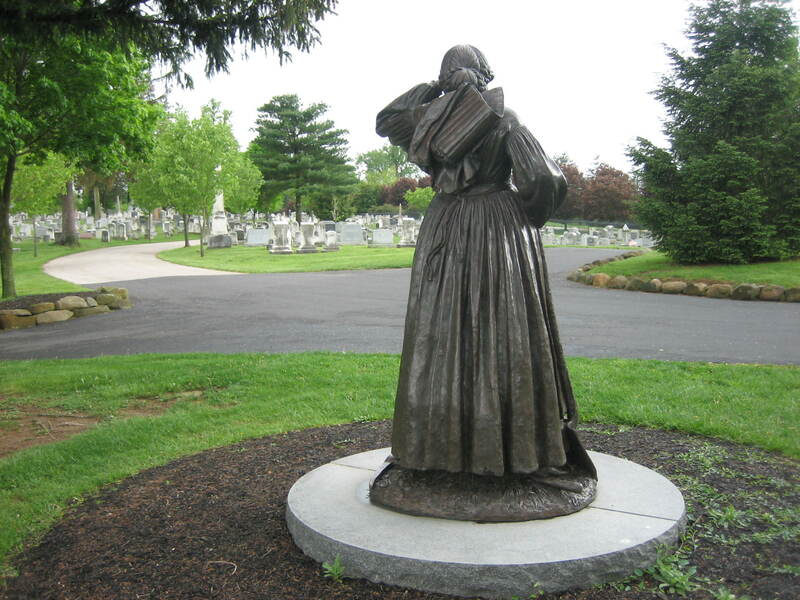 It is known as the Gettysburg Women’s Civil War Memorial and represents the work of all the women involved in the battle and the Civil War. This view was taken from the northeast facing southwest at approximately 4:30 PM on Friday, May 9, 2008. Elizabeth and Peter are buried in Section of Evergreen Cemetery. The 1860 census shows that Elizabeth Thorn was “white,” and that she lived in the same dwelling and was part of the same family with Peter Thorn (1826-1907) in Duchy Hesse, Germany; Frederick Thorn (1857-) born in Pennsylvania; George D. Thorn (1859-) born in Pennsylvania; John Masser (1797-) born in Hesse Darmstadt, Germany; Catharine Masser (1797-) born in Hesse Darmstadt, Germany; Baltzer Masser (1826-) born in Hesse Darmstadt, Germany. Peter Thorn’s real estate was valued at $800, and his personal estate was valued at $200. This view was taken from the northeast facing southwest at approximately 4:30 PM on Friday, May 9, 2008.